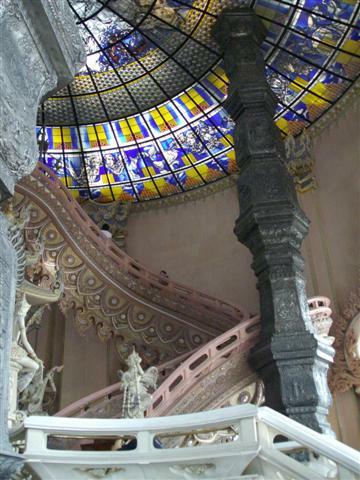 The Erawan Museum has become a much revered site by Thais since its completion in 2000. 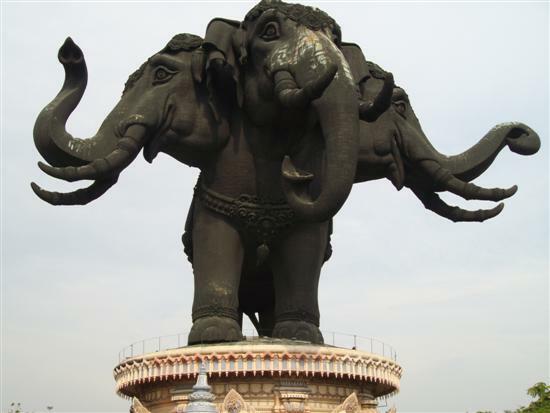 Covered entirely in bronze and dominating the skyline, the sculpture of the giant three-headed elephant Airavata is located in the Bangkok province of Samut Prakarn just 28km, or about 45 minutes drive outside of Bangkok. In Thai, Airavata is known as Erawan and so the building is most commonly called the Erawan Museum. The three-headed elephant stands on a pink building that forms the pedestal and inside houses the collection of ancient religious objects that belonged to the late Khun Lek Viriyapant. The pedestal is covered in tiny tiles of Thai Benjarong ceramics. There are many different stories about what prompted Khun Lek to build this museum. The one that I heard is that Khun Lek was a successful businessman and the government wanted to repossess his land to build the nearby freeway. Khun Lek's plan was to build a religious monument that was so popular with the people that the government would not be able to take the land off him for fear of upsetting the spirits and local people. Well it seemed the plan worked because the freeway does not encroach on his land. Whether you believe this story or not, the finished Erawan monument is absolutely stunning in both its external presence and grandeur and internally for the level of detailed and decorative design. 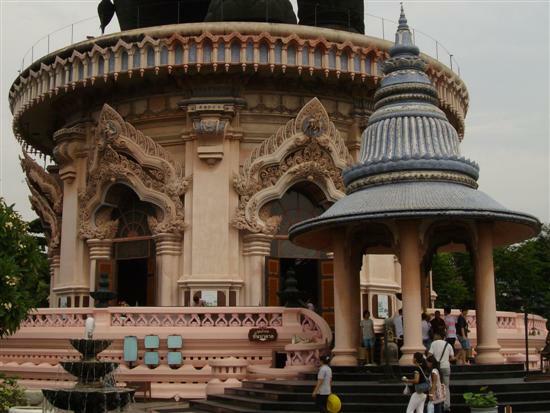 In addition to the Erawan Museum, Khun Lek also masterminded the Ancient City, a place that brings together examples of Thai architecture from each region of the country and the Sanctuary of Truth. 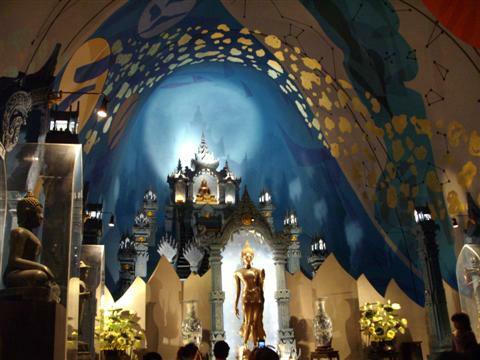 The Temple of Truth is located near to Pattaya and work commenced about 20 years ago and is still ongoing. I will be shortly bringing you something on the Ancient City and a visit to the Temple of Truth is planned for the future. By all accounts the Sanctuary of Truth sounds similar to the Gaudi project in Barcelona. There are guided tours of the interior of the museum; the one I took was in Thai but they do have English guides as well but at a reduced frequency. Don't worry, many of the wall placards are translated into English and the you will still be able to appreciate the architecture, but you will miss out on some of the finer details. The museum consists of three floors and each of the floors symbolises the Thai belief about the various parts of the universe. The basement floor represents the underworld and contains a collection of Chinese vases from the Ming and Qinq dynasties and a history of the museum's construction as photographs and wall placards. Above the basement is the middle level, this represents the human world. There are four tin-plated pillars in this level, representing the four major religions of the world. 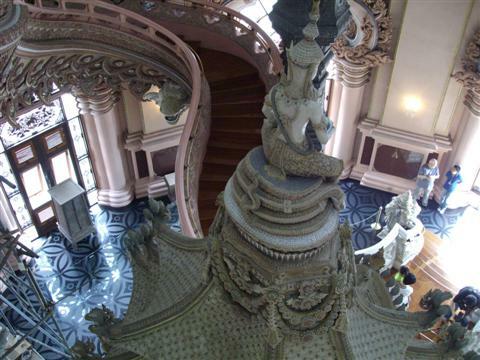 Two staircases studded with porcelain lead upstairs, passing the altar of Kuan Yin, the Goddess of Mercy, on the way up. On the landing at the top of the stairs you have a choice of more stairs, or a lift which goes up one of the hind legs of the elephant. The next level has a small window that looks out onto the gardens below and the level just above that is a celestial chapel displaying more buddha images - a walking Buddha and eight more in a variety of postures around the outside. The walls are decorated blue and gold and the lighting is just incredible. This is the Tavatimsa Heaven. Outside there are gardens where you can find a place to sit and soothe away your worldly worries or watch as people rid themselves of bad luck as they set adrift small lotus leaf boats in the encircling moat. Opposite the entrance to the Museum is a viewing platform, it is a little past the outdoor temple and just before the toilets. If you go up a few stairs, then you will be able to take that special photograph of the three-headed elephant standing on the pedestal. 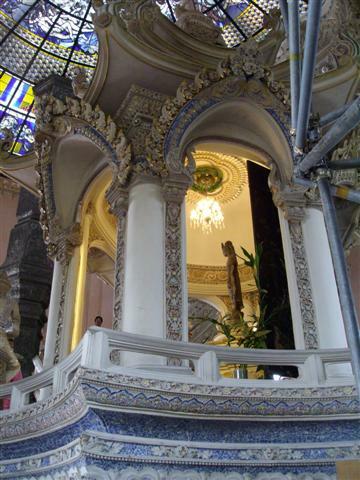 The more I think back about my visit to the Erawan Museum the more I realise I did not truly appreciate the beauty and workmanship that has gone into making it one of the top ten Bangkok tourist sites to visit. There are just so many levels of detail to appreciate that my quick visit did not do it justice. I will go back there because I feel I missed so much on my short visit.